These same dealers with shops also shared that they are selling more than they are buying. The good news is this market gives them an opportunity to clear out the "back room," but it also means customers searching for specific items may have difficulty finding exactly what they want. Some of the dealers on the bourse offered the America the Beautiful silver sets. These are bullion coins, each weighing five ounces of silver, with the same design as the America the Beautiful quarters. The sets contain the five designs (25 oz. of silver) from 2010: Hot Springs National Park (Arkansas), Yellowstone National Park (Wyoming), Yosemite National Park (California), Grand Canyon National Park (Arizona) and Mount Hood National Forest (Oregon). In addition to the bullion coins and small bullion bars, a few of the larger 100 oz silver bars were available - but not many. Silver products are in high demand and are getting more difficult to replace when the dealers' current inventory is sold. Taking a look at history, we've added silver charts <Silver-Charts.html> and gold charts <Gold-Charts.html> that show the metals' performance since the Greater Atlanta Coin Show started in 1988. But, of particular interest is how the metals have performed in the last year and in the beginning of 2011. Did you know that silver increased over $10/oz and gold over $100/oz between the Friday before the January show and the Friday before the April show. Perhaps it's gold and silver bringing people to the show, or maybe it's a numismatic interest, either way, we continue to have a lot of guests visit the show. We hope to see you at the next monthly coin show on Sunday, May 15, 2011 in the Joe Mack Wilson Ballroom. The weather provided a beautiful Sunday for the coin show with the sun shining, sometimes through a high, thin layer of clouds. The day was warm with the temperatures not quite hitting 90, but the mid-80s made it almost air-conditioner weather. As for the coin show, this was our first show downstairs in the Lyon and Sanford rooms. Through lessons learned, we do have a few kinks to work out as some people didn't realize we occupied two separate rooms. Before the next scheduled show downstairs, we will have another sign printed that points guests to both rooms. We certainly appreciate all of the people who did come downstairs to find the show. We recognized our friendly regular attendees and noticed quite a number of new faces as well. Repeat visitors or newcomers, all of you are welcome and appreciated. With the economic turmoil and the sky-rocketing metals, the main interest on the bourse continues to be with bullion. People haven't given up their numismatic interests in coins and currency, their focus has just shifted for awhile to the bullion areas of interest. Two of our dealers work primarily with buying bullion - either silver or gold, and less frequently, platinum. Lines at their tables kept them busy for much of the day. People took advantage of the higher metals' market prices to get cash for their silver and gold. On the other hand, people came to buy silver and gold as well. Though, several dealers commented that most of the people were interested in silver over gold this week. As a result, one dealer sold out of his 10 oz. silver bars and commented that replacing his inventory of silver bars was getting difficult. Several of our dealers manage shops as well. They claim that their customers are buying American Silver Eagles, but people coming to their shops to sell eagles are rare. (The Mint's schedule shows 2011 proof American Silver Eagles due to be available to the public on 6/30/2011, and uncirculated versions are still "To Be Determined.") That means the silver eagles are getting more and more difficult to find. It's springtime in Atlanta with warm days, even somewhat hot, and beautiful flowers blooming everywhere. 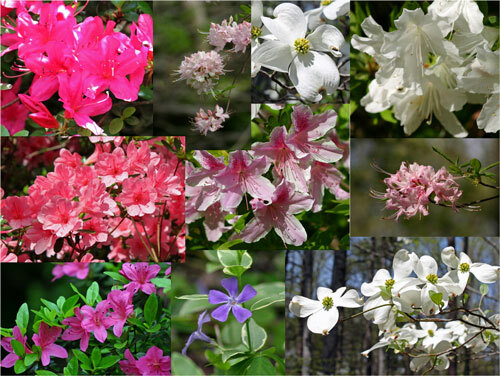 In the forest wild azaleas bloom while almost every yard has some type of azalea decorating the landscape. And, let's not forget the dogwoods whose white blooms almost hurt the eyes when reflecting the spring sunlight.